What happens to our consciousness after we die? What some people call a soul, they believe, will head off for heaven, the afterlife, Elysian fields, nirvana, or another round of reincarnation. Or, when we die it’s game over; you got your chance at being a unique and self-conscious arrangement of carbon atoms for a period you no doubt considered too brief, but that’s it, you and your consciousness, or soul, or whatever, are history. It’s a big, and unanswered question, one that can make a big difference in how we conduct our lives. Most societies, of course, have conjured a more sanguine, “see ya later,” narrative (except for that hot place, of course) because it’s a more comfy way to think about such things. Cogito. Cogito, ergo sum is the way Rene Descartes, a philosophical reductio that takes us right down to whether we are a mind and/or body that are here in the first place. Descartes concludes in favor of self-consciousness, but as Shorto affirms, the Frenchman who lived in the low countries and died in Sweden did a lot more than that he basically gave birth to modernism and ignited (or poured fuel upon) the debate between Faith and Reason, and mind/body dualism. The philosophical conundrums are woven around the tantalizing mystery of what really happened to the philosopher’s bones. These dualisms-faith and reason and mind and body-are comingled in the 17th century mind, or at least those minds inclined to think about such things, who were mostly churchmen and philosophers (this includes people we call scientists these days). Mind, consciousness, what was closest to the locus of the Òsoul,Ó had to be distinct and separate from the body (really the brain, in this case). If not, the result was “materialism,” the idea that mind and its thoughts exist only in the physical brain, in its neurological connectivity. Ergo, when the brain goes, so does the mind and, if mind is the “soul” of us, so it goes. The Church, that is the Roman Catholic Church, of which Descartes was a baptized member, if not much of an adherent, would not have liked that. That debate remains, but its contenders in these times end to be among the neo-Freudians and the Cognitive scientists and neuro-pharmacologists who have found operative connections between emotions and brain chemistry. Even our newfound digital phenomena comes into play, at least metaphorically (or until we discover means to connect carbon-based life with silicone-based “life”). We might well ask ourselves if the software on our computers could exist if not because it must reside on some sort of hardware. Where does our software go when our hard drive crashes and dies? Remember how Hal 9000 felt when Dave took apart his “mind” silicone chip, by silicone chip? This is not my usual tendency to digress, but to connect the intellectual world pried open by Descartes’ cogito long ago with the creation of the modern world for which Shorto rightly gives him considerable credit. Shorto drags the slight, unhandsome philosopher out of your old Philosophy 101 class and smack into the middle of the most pressing political and social issues of our times. His approach is two-fold: one to engage us in a mystery (what happened o the bones?) 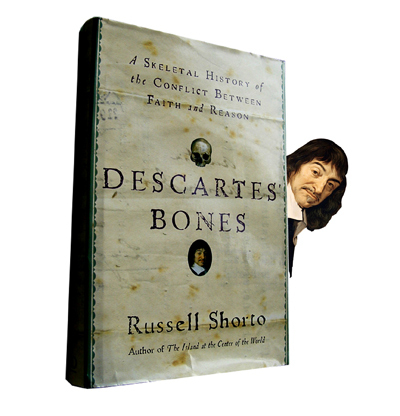 that allows him to connect the physicality of Descartes with issues related to brain physiology (since the prime bone of concern is the skull of Descartes). Second, he connects the secularizing influence of Cartesianism in the late 1600s and onward with the resurgence of religious fundamentalism and anti-modernism in the present age. Descartes raised hell, literally for Scholastic philosophers of his time, such as Gysbert Voetius, and Aristotelian theologian and rector of the University of Utrecht, who perceived the dangers of Descartes’ influential 1637 Discourse on the Method of Rightly Conducting the Reason and Seeking Truth in the Sciences, Plus the Dioptric, Meteors, and Geometry, Which Ares Essays in This Method, to the academic establishment. Voetius railed against The Method, linking it with the other major challenges to an educational system that were dominated by Roman Catholicism’s problems with Galileo and Copernicus. Descartes, a gifted mathematician who pioneered the application of mathematics to physics and the use of algebra for geometrical shapes that would be the basis of the calculus, was also, this reader learned, very much the rational empiricist. After he decamped from Leiden for Stockholm at the invitation of Queen Christina, he engaged in examinations of animal organs and vivisections in order to learn about the relationships between internal organs. This was a time when life expectancy in France and the rest if Europe was 28 to 30, and half the children born in London were dead by age fifteen. Wars figured in these statistics, but so did misunderstood and often fatal diseases that were called ague, apoplexy, flux, dropsy, commotion and consumption. There were a lot of mistakes; even Descartes believed that the heart’s purpose was to heat blood, not pump it. Physicians still employed astrology and phlebotomy (bleeding), which is how Descartes himself, who first refused to be bled at his final illness, but in weakness relented, was probably ÒkilledÓ in Stockholm in 1650. Then began the curious and circuitous journey of the philosopher’s remains. He was first buried in a rather plan grave in Sweden (where probably much of the putrefaction of the soft tissues must have taken place), but the French wanted the man who was the most famous philosopher of his time back home. It’s a long story, but the skull might have been removed before the casket (the bones were apparently separated to fit into a smaller box) was out of Sweden. The French soon discovered this, but there wasn’t much they could do about it and even then there was the debate about where Descartes should come to rest in Paris. He had a few different places of interment and spent time in a Museum of French antiquities during French Revolution. The bones that ended up a St. Germain-des-Pres may not even be the right bones, those having been ground up when another church where he was buried, St. Genevieve, was torn down and where the plaque was misaligned with the placing of the casket. That question will likely be settled more by politics than philosophical discourse. Even so, we will be left with the big question that is a corollary to the cogito-where does it all go? We are not even certain that this skull once contained the brain that “contained” the brilliant mind of Rene Descartes.